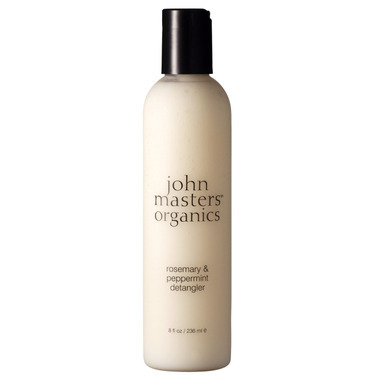 The lightweight formula of John Masters Organics Rosemary & Peppermint Detangler detangles and conditions with a highly-effective combination of 18 certified-organic ingredients: natural soy proteins and borage oil replenish lipid content, wheat & soy proteins restore strength and shine, and essential oils of rosemary & peppermint provide an exhilarating scent. Usage: Good for all hair types. Excellent for fine hair. Based on the previous reviews I thought it would be great but I was actually disappointed. For the price I would expect a lot more. My doterra conditioner is much better. Very good. It's definitely not a deep conditioning treatment but good to use a couple times a week. Smell is nice as well. This conditioner is lightweight and has a really nice soft scent. It's great for my fine hair and works just as well for my daughter's long hair. The best detangler/ conditioner ever! I have fine blonde highlighted hair that tangles up like a kid's. I have tried so many different detanglers that leave my hair either limp or just don't do anything. This one is amazing!! A little goes a long way! Well worth the price!! My new favourite detangler. When I shampoo my hair feels stripped of natural oils, even though I use mild shampoos. I put this on and it's as if my hair is saying aaaaaah. I love how it feels going on. I also love that since this can also be a leave in conditioner, I don't feel I need to rinse out the conditioner thoroughly. And It is really a very effective detangler. Fantastic product worth every cent, made with organic products and free of nasty environmentally harmful chemicals like the ones found in mainstream drugstore brands. A little goes a long way, even on long hair, so it lasts longer than one might think, and leaves hair silky and light with a mild peppermint scent. This detangler/conditioner is very light, but works well. The smell is really pleasant. I have long hair, and you don't need very much of this product when using it as a rinse-out conditioner. Everything I could ever want in a leave-in conditioner... natural, effective, and smells great!